Officials, citizens and community leaders gathered Monday afternoon to celebrate the opening of the new senior center, Brunswick Center at Supply, housed in 101 Stone Chimney. After Brunswick County purchased the 14,721-square-foot building from the Brunswick County Association of Realtors December of 2016, work began to get it open as a senior center. It joins three other senior centers, in Leland, Southport and Shallotte; with the completion of the senior center in Calabash, Brunswick County will have one senior center in each of the County’s five districts. Brunswick Senior Resources, Inc. (BSRI) also operates numerous senior sites throughout the County. In thanking all those who helped reach that goal, BSRI CEO and President Jim Fish mentioned the work by County Commissioners and staff to build centers when appropriate, but also to consider renovating existing buildings when it made more sense. World War II veterans Alex Moskowitz and Julian Odom help cut the ribbon at the new Brunswick Center at Supply. 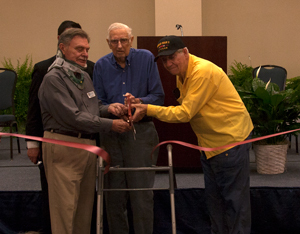 County officials were joined by two WWII veterans, Alex Moskowitz and Julian Odom, for the facility’s official ribbon cutting. After cutting the ribbon, Moskowitz and Odom chatted about the locations where they had been stationed during and after WWII. “This is a ready-made senior center,” said Board of Commissioners Chairman Frank Williams of the new facility. Williams added that the none of the current Commissioners were on the Board when the goal of having a senior center in each district originated in 2005. The Brunswick Center at Supply is able to serve meals on site to seniors, as well as facilitate the delivery of Meals on Wheels. The building’s large banquet room can house senior activities, in one large room or divided into portions, with a conference room and office space for BSRI staff. “Look at how fast this County has grown,” Williams said, adding that seniors in Brunswick County are approximately 32 percent of the County’s population, while statewide that number is 16 percent.